The US economy is still humming along with continued GDP growth, low unemployment, and mild inflation. The latest and final reading of 2.2% for 4th quarter (Q4) US real GDP and 2.9% for the full year of 2018 is solid. Looking ahead, a survey by the National Association for Business Economics forecasts 2.4% for 2019 US GDP, while the Federal Reserve (Fed) has a median forecast of 2.1%. Globally, the picture is cloudier as International Developed Market economies struggle with little to no growth despite years of supportive monetary policies. The Fed has shifted its policy stance, from quantitative tightening to neutral, by indicating that current conditions warrant pausing interest rate hikes and ceasing the roll-off of balance sheet assets. It’s been said that the Fed usually raises rates until something “breaks”, but now that the Fed has pivoted to a dovish stance prior to an economic downturn, some think that this economic cycle can be extended. Interest rates, however, have shifted across the yield curve, and there is now a big slump in the middle of the curve with 2, 3, 5, 7 and 10-year Treasuries yielding less than the 3-month bill. This is visible on the below chart versus the yield curve on Christmas Eve (red line), which is more upward sloping when quantitative tightening was expected to persist. The bond market is signaling that a rate cutting cycle is upcoming, potentially due to an economic downturn or recession. The Fed’s shift in policy and other central banks’ continuance of accommodative measures may facilitate a soft landing or prolonged expansion. Chart created by Hanlon Research using data obtained from Bloomberg. A slowdown in the housing market has been cause for concern with home prices plateauing after years of strong recovery since the Great Recession. Perceived stability of the equity value in people’s homes is important for consumer confidence in spending to support a growing economy. Mortgage rates have dropped significantly since the peak last year, which has re-ignited some interest from potential home buyers. Will lenders be enthusiastic about lending at these low rates when even the Fed is preparing for an economic slowdown? There is more competition than ever for mortgages with large non-bank lenders, so banks may have no choice. It takes time, however, to assess any real slowdown in the housing market as data varies wildly by region as supply, taste, and demographics always play large roles in the market. The trade dispute between the US and China persists as a drag on global growth. The two sides have maintained dialogue and paused on the escalation of tariff implementation. A swift and favorable out-come is strongly desired by all parties, with businesses and markets desperate for clarity on the future of global trade. Forced technology transfers and subsidies of state-owned enterprises have benefited China in their rise on the global stage, and many are skeptical of their future adherence to any potential deal. Brexit is another global concern; both of these concerns shall be further clarified in the coming quarter. Interest rates again are a non-event, meaning low for longer continues to be the theme. A double-top chart pattern on the 10-Year US Treasury Note yield, which twice failed to break above 3.25% (Chart below), confirms this. Interest rates have come well off their highs thanks to several Fed members shifting to a dovish (no more rate increases) stance at various speaking events, primarily due to concerns over global growth. The US 10-year Treasury yield stayed mostly range-bound between 2.60-2.75% through the January meeting, when the dovish stance was confirmed. Then it collapsed below 2.4% after the March meeting, when the Fed announced its balance sheet run-off will end in the fall. The closely watched dot plot of expected future interest rates now shows no more hikes in 2019 and one hike in 2020. Bonds have rallied along the way, particularly high yield and dollar denominated emerging market bonds, as the stress related to late-cycle rising rates has been removed. Chart courtesy of Stockcharts.com Chart, commentary, and opinions are those of Hanlon Investment Management. US Equity markets continued their rally off the Christmas Eve low into Q1 2019 as earnings expectations for 2019 have stopped falling, for now. Double-digit earnings growth is expected for 2019 versus 2018, and while most companies cleared high hurdles for Q4 earnings expectations, investors were focused on stocks with more perceived growth potential. Equity returns were strong in Q1 2019, led by the technology-heavy Nasdaq Composite Index which gained 16.81%, followed by the S&P 500 Index with a return of 13.65%. The Dow Jones Industrial Average appreciated by “only” 11.81%, as some of its established blue-chip components experienced stock specific challenges (like Boeing with their 737 Max issue) and lagged upstarts with growth potential. The Q1 performance of the Russell 2000 Index of small-cap stocks had a 14.58% return. The Technology sector led the major S&P 500 sectors, up 19.78%, as stock buybacks continued to help boost prices on some of the largest names in the group. Stock buybacks have surged since the implementation of the tax cuts in 2018. Companies have displayed a willingness to use the extra cash to benefit shareholders by buying up their own shares in addition to increasing dividends. According to S&P Dow Jones, 18% of the S&P 500 (90 companies) reduced their float of publicly available shares by 4% or more in Q2 2018, while collectively setting the 4th consecutive quarterly record for corporate buybacks in Q4 2018. Real Estate Investment Trusts (REITs) performed well, supported by their relatively high dividend payouts and boosted by falling interest rates. Financials underperformed since the beginning of March, with bank interest margins expected to be squeezed by the shape of the yield curve. The Healthcare sector has been the laggard during Q1 with drug prices having come under the microscope in a bipartisan way, while 2020 uncertainty looms with many potential democratic candidates touting “Medicare for All” plans. The large-cap equity portion of our Hanlon Tactical Models entered Q1 invested at market weight in just 3 GICS sectors: Consumer Staples, Utilities, and Healthcare. The defensive positioning was a product of the heightened volatility in Q4. 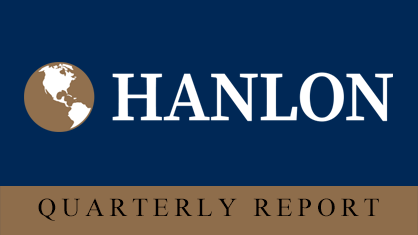 We had exposure to all 11 sectors by the end of January, but the cautious stance caused Hanlon Tactical equity positions to underperform the broader equity market during Q1, as the V-shaped recovery led to early-quarter gains for the S&P 500 Index. Equity markets are back near the mid-October peak, which had become a technical battleground, and therefore a level of resistance, that appears to have been broken on the last trading day of Q1. Smaller positions to small-cap, mid-cap, and emerging markets were maintained in our Tactical Models throughout the quarter as we continue our bullish stance on these Asset Classes. We ended the quarter in all sectors except for energy. In the Managed Income portion of our Hanlon Tactical Models, we were also defensively positioned to begin 2019. Small allocations to REITs persisted throughout the quarter, while positions in high yield and emerging market bonds were scaled up starting in January. Convertible bonds and preferred stocks were also added in January and preferred stocks were swapped with long-dated Treasury bonds in early March that helped lift performance. Strategic equity positions within the models stormed back in Q1, reversing much of the pullback experienced in Q4. A strategic overweight to small-cap equities benefited the less conservative allocations in the Hanlon Strategic and All-Weather models (Growth, Moderate Growth, Balanced), as the Asset Class performed extraordinarily well. The Invesco S&P 500 Low Volatility ETF (SPLV) was added at appropriate amounts to the more conservative allocations in 2019, and by returning 13.48% in Q1, is immediately delivering broad equity-like returns with reduced volatility. High yield bonds led our fixed income returns, as the SPDR Bloomberg Barclays High Yield Bond ETF (JNK) gained 8.11% during Q1. In addition to the significant strategic exposure to the Asset Class, Hanlon All-Weather models benefited from additional high yield bond exposure via the allocation to the Hanlon Tactical strategy. US dollar and local currency denominated emerging market bonds were the next best fixed income performers, with returns near 5% during Q1. The “Alternatives” portion of the Hanlon Strategic and All-Weather models performed well during Q1, with the energy-focused JPMorgan Alerian MLP ETN (AMJ) leading all holdings with a return of 16.43% for the quarter. The positions invested in natural resources (commodities) and Real Estate (REITs) also had double-digit returns. New this year, we replaced the iShares Core US Aggregate Bond ETF (AGG) with the Pimco Active Bond ETF (BOND) for the core investment grade bond allocation. Our research concluded that the historical “alpha” (returns better than market returns) was probable using active management as opposed to passive management, in the investment grade bond category and by BOND in particular. With one quarter in the books, the trade has benefited our models with BOND outperforming AGG by 0.39%. As always, we will do what’s in the best interest of our clients consistent with our principles of Passion, Integrity, Vision, and Care. We will continue to monitor for opportunities, look ahead for market weakness and make corresponding defensive moves in our Tactical Models to seek downside protection and upside participation. For investors seeking a complete portfolio asset allocation solution, our Strategic Models or All-Weather Models that combine buy-and-hold strategy with tactical protection, are the answer. The information contained herein should not be construed as personalized investment advice and are not intended as buy or sell recommendations of any securities. Past performance is not a guarantee of future results. There is no guarantee that the views and opinions expressed in this Quarterly Report will come to pass. Investing in the equity and fixed income markets involves the risk of gains and losses. An investor cannot invest directly in an index. Unmanaged index returns do not reflect any fees, expenses, or sales charges. The use of a Financial Advisor does not eliminate risks associated with investing. Consider the investment objectives, risks, charges, and expenses carefully before investing. Information presented herein is subject to change without notice. Hanlon has experienced periods of underperformance in the past and may also in the future. Hanlon is an SEC registered investment adviser with its principal place of business in the State of New Jersey. Being a registered investment advisor does not imply any level of skill or training. Hanlon is in compliance with the current federal and state registration requirements imposed upon registered investment advisers. Hanlon may only transact business in those states in which it is notice filed or qualifies for an exemption or exclusion from notice filing requirements. This Quarterly Report is limited to the dissemination of general information pertaining to its investment advisory services and is not suitable for everyone. Any subsequent, direct communication by Hanlon with a prospective client shall be conducted by a representative that is either registered or qualifies for an exemption or exclusion from registration in the state where the prospective client resides. For additional information about Hanlon, including fees, services, and registration status, send for our disclosure document as set forth on Form ADV using the “disclosures & privacy” link at www.hanlon.com or visit www.adviserinfo.sec.gov. Please read the disclosure statement carefully before you invest or send money.